The glitziest night of Taiwanese television took place at the 51st annual Golden Bell Awards Friday night in Taipei. I only pay attention for the fashion and if certain TW-dramas or acting talent that I happen to like for that year are nominated, and this year it was all about Marry Me or Not with Roy Qiu and Alice Ke. The two leads were nominated for Best Acting awards but it was Alice who walked home with her Best Actress trophy while Roy lost out to frontrunner Chris Wu who won Best Actor for his role in period Taiwanese drama A Touch of Green, which also took home Best Drama. The red carpet was more interesting than the Korean awards shows, per usual, and Alice was stunning in both her white red carpet dress with the rocking horse print and layered white her stage dress with chocker and butterfly appliques. None of the winners were a surprise and the entire event went down with smooth precision. Fans of popular SETTV drama Bromance also got a treat to see leads Baron Chen and Megan Lai reunited again. Congrats Wu Kang Ren, by the way Wu Kang Ren has made the announcement on his official facebook page that he has no official English name few months ago and not sure who edited his name to Chris Wu in wikipedia. He asked fans to call him Wu Kang Ren in the future. I was hoping Cheryl to win the best actress award. Alice Ke is very good in Marry Me or Not (especially as compared to her greener days in Office Girls) but Cheryl was phenomenal in A Touch of Green… Oh well, still congratulations to all. A touch of Green’s Lien Yu Han also won best newcomer award, I loved her performance in that drama. She’s really good for a rookie but she was kind of brought down by her next drama in SETTV 極品男友, it shows importance of a drama’s writer and director. By the way the award ceremony wasn’t that smooth, it went on for 5.5hrs, media has been criticizing the organizer this year – SETTV for their awkward choice of background music, extended hours and they didn’t even give Wu Kang Ren and Lien Yu Han the time for interview during red carpet because they didn’t keep track of time and spent too much time interviewing “their own” people/dramas. They also had a broadcast error during the nomination clip presentation for Children show by showing the wrong clip. Netizens have been saying this is one of the worst Golden Bell ceremony by how choppy it’s being done.. and as someone who watched pretty much the whole thing, I agree. megan lai dress is so pretty and comfy…it looks a bit like blanket LOL but still looks nicer than korean actress dress..
im pretty shocked to see kim jongkook in the picture..did he receive an award or something? LOL I came here to the comments to see if anyone mentions him. I vaguely remember he had that period drama outside SK. 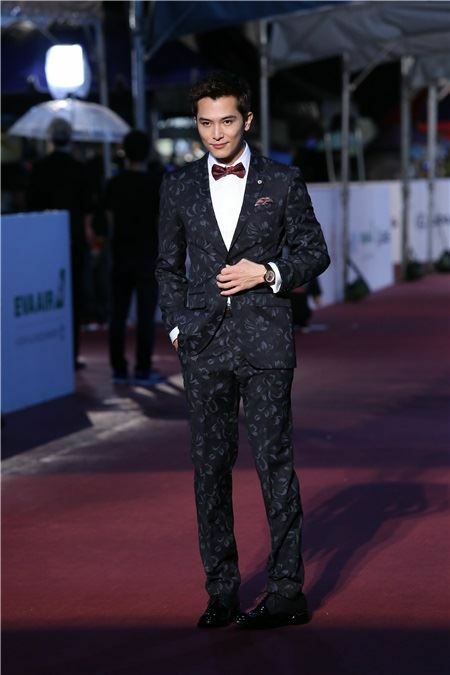 Could it be a TW or C-drama and that’s why he’s here for the awards night? Wait Gui Gui attended too? And she didn’t reunite with Aaron!? No!!! Lol, but anyways happy for Alice I really enjoyed Marry Me or Not. Unfortunately I haven’t been able to check out A Touch of Green because I can’t find it with English subs, however, Chris always does a great job in all his roles so I’m sure the award was well deserved. Kim jong kook was there? Happy for Chris and Alice but I think the highlight of the show was Megan and Baron reuniting after 3/19. I’m so happy Chris Wu got the best actor award. The guy’s an amazing actor but I feel like he gets slept on a lot. Hope he grows out his hair though! I read @carolie541 ‘s comment but it’s gonna be hard to call him anything else but Chris when I’ve been a fan for so long. Why does Chris Wu look so under the weather? It’s finally his turn to shine!